Home NEWS & EVENTS Meet the impressive STEAM Dream Team! Meet the impressive STEAM Dream Team! Bergen Elementary: Meet the impressive STEAM Dream Team! 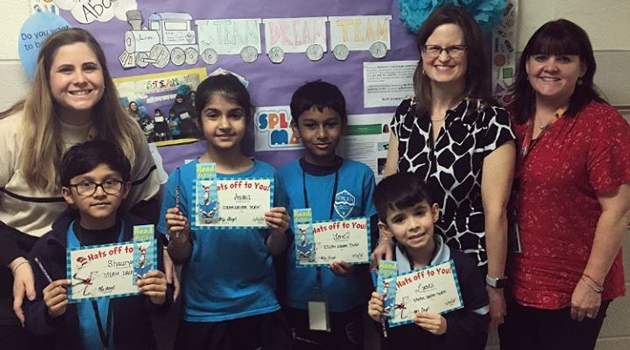 Lucas U. from KA, Shaurya M. from 1A, Ayana K. from 2B, and Joel S. from 3A worked extremely hard this month to have the most amount of problems and quizzes completed on Accelerated Reader and Splashmath. Each month, students are highlighted for their active participation within Accelerated Reader and Splashmath. Do you think you can answer more than 960 Splashmath questions next month and take more than 70 Accelerated Reader quizzes?